From approximately August to late September, beautiful blooms spread across the West Coast in the most picturesque of ways. Of course, this is a sight to see! We’ve got the scoop on the best spots to head to, when the best times are, which types of spring flowers you can expect to see and so much more! From now until 30 September, the protected area of Postberg within the West Coast National Park is open to the public! Here you will find blankets of stunning wildflowers of all different colours covering the park. Which flowers will you see? Daisies, sporries and magriets. What else can you do here? Keep an eye out for the Kraalbaai, Preekstoel and Uitkyk picnic areas. You’ll be able to enjoy the incredible blooming views while you eat your favourite snacks with your loved ones. How much does it cost? 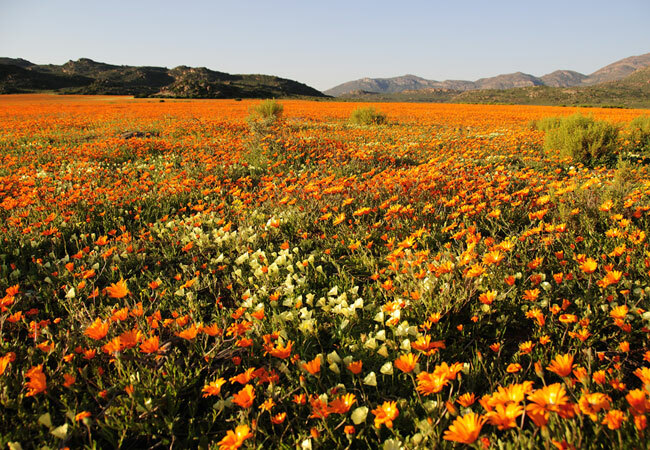 During flower season, SA citizens & permanent residents can enter the park for R77 per adult or R39 per child. SADC nationals (with passports) can enter for R111 per adult & R56 per child. And lastly, the standard conservation fee for tourists comes in at R172 per adult and R86 per child. Every Spring this desert landscape transform into a floral wonderland when the rolling hills are covered in a sea of colour. Fun Fact: these flower fields are comprised of around 3,500 different species of plantlife! Which flowers will you see? A variety of succulents, bulbs & annuals. What else can you do here? Head out on a long walk, hike or hop on your mountain bike and enjoy the scenic routes available for your pleasure. The Citrusdal has become a popular family getaway destination, so why not add it to the list during flower season? Found along the N7, this area is rich with fun activities to take part in. Which flowers will you see? Maartblom, bloedblom, funbos & daisies. What else can you do here? Bird-watching, hiking, camping, zip-lining, rock-climbing, fishing and of course soaking in the natural hot springs. How much does it cost? One of the best parts about the Citrusdal is, there are no entry fees! Found along the R315, this stunning wildflower reserve is home to a wide variety of flowers and many from the Cape Floral Kingdom to be exact! Now that would be a sight not to be missed. Which flowers will you see? Lachenalia, bulbs, chincherinchee, butterfly lilies and more. What else can you do here? Stop for a scenic picnic with your loved ones where you can also enjoy some bird-watching and game-spotting! Or, simply head off on a leisurely stroll along the available walking paths. This beautiful spot is only a short way along the R27 and boasts glorious views of spring flowers, as well as amazing whale-watching opportunities! Which flowers will you see? A variety of Karoo succulents & fynbos. What else can you do here? Whale-watching (of course! ), hiking, cycling, kayaking, leisurely nature walks, picnics and game-spotting…to name but a few! Now who can forget about the most famous flower-viewing destination in the Cape, Kirstenbosch?! This unforgettable 36-hectare garden on the eastern slopes of Table Mountain is known by most, and loved by all. The best part? It’s so close to the city! Which flowers will you see? Fynbos, proteas, birds of paradise, daisies and so much more! What else can you do here? Picnic on the beautiful rolling grass hills, access one of the many hiking spots, grab a bite at one of their two restaurants or head out on a quiet stroll.